Do you want to save money, regulate temperature, AND keep your home efficient? Then it may be time for a programmable thermostat. 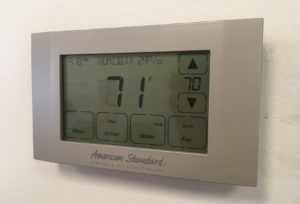 Programmable thermostats offer these benefits and many more as outlined in this article by Compact Appliance. They truly are the new standard, and the best part is they are easy for a DIYer to install! See some of the top models as compared by Consumer Reports here. Then, give us a call if it’s not a task you’d like to take on yourself.